Sometimes, dreams come true. That’s what it felt like at Moment Factory as we prepared for the unveiling of the Wonderbox at Paradise City in Korea, a sprawling new 5-star integrated resort that dares to dream big. The ambitious art hotel complex was created by a joint investment partnership of Korean hospitality experts Paradise Group and Japanese entertainment company Sega Sammy, collaborating closely with an impressive array of international artists, architects and designers. Home to pieces by Anish Kapoor, Jeff Koons, Damien Hirst, and Yayoi Kusama, the resort features a lavish spa, opulent restaurants and inspired room design. 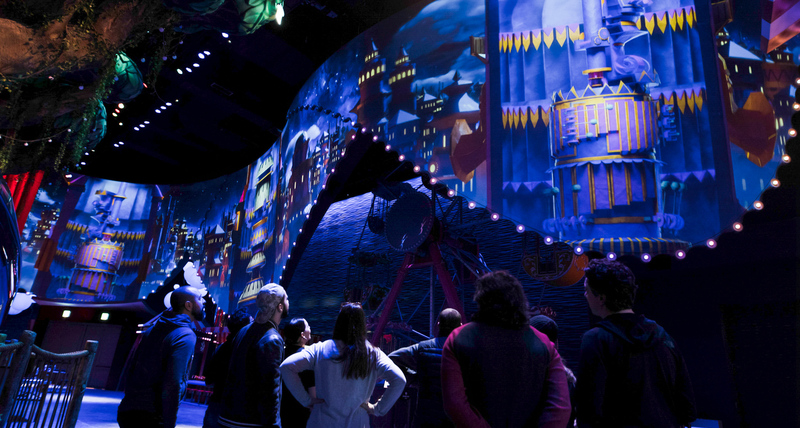 Conceived to offer visitors a new and unique entertainment experience, Paradise City also features an indoor family entertainment park called the Wonderbox, for which we created cinema-quality content, interactive games and atmospheric multimedia elements. 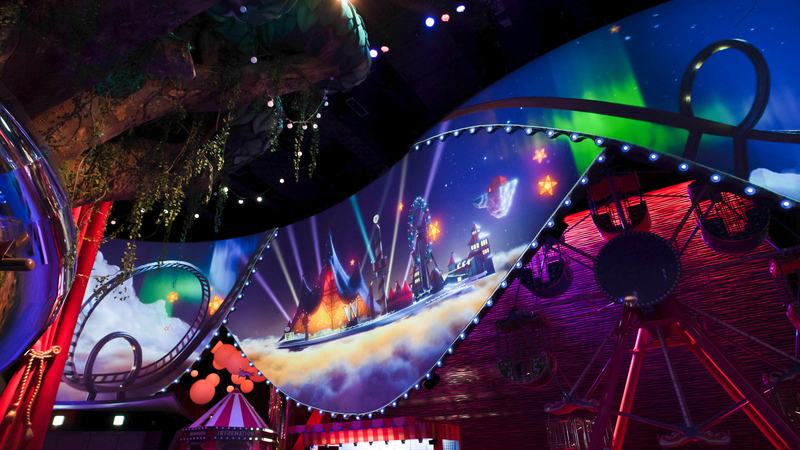 Inside the Wonderbox, we used multimedia technologies to cast a layer of enchantment over a more traditional themed entertainment infrastructure. 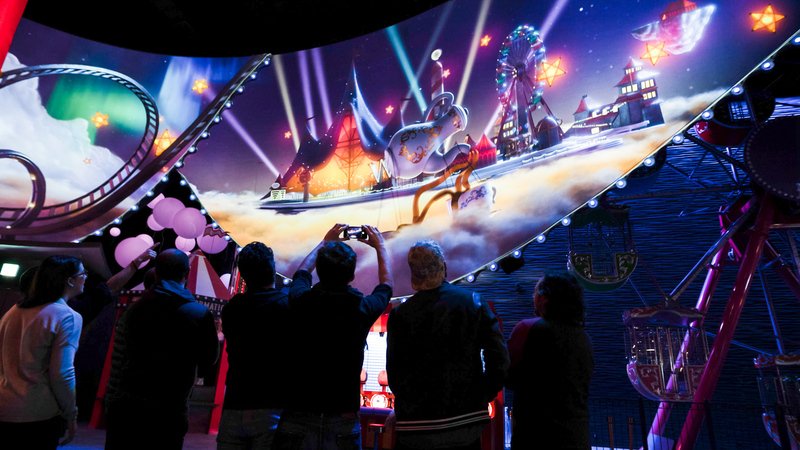 As executive content producer, our team created immersive worlds that transport visitors into an imaginative twist on the classic carnival. 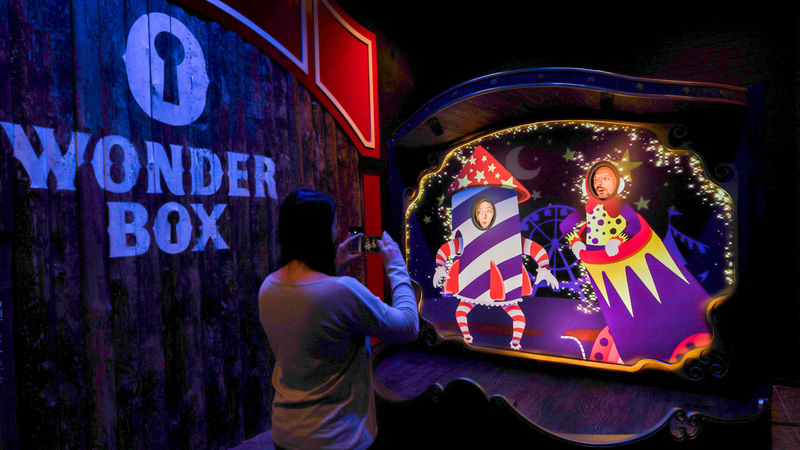 When guests step into the ingenious architecture of the Wonderbox, they’re greeted by an interactive installation that reacts to their movements. Above, a 3D projection mapping of the Wonderbox logo reflects and reacts to the colours in its surroundings. 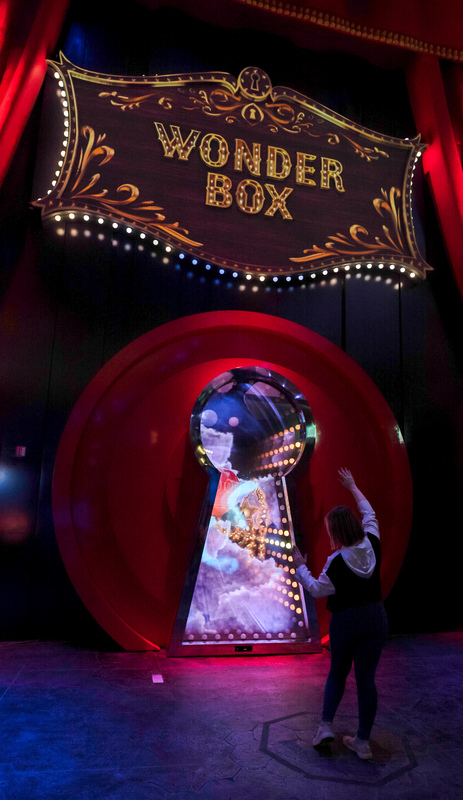 Several times each day, the lighting, video content and musical signature of the Wonderbox are completely transformed, ushering guests into a new world of surprise and enchantment. Guests move from a magical forest teeming with mythic creatures to a cotton candy world spun out of sweet treats and chocolate. They pass through a mysterious musical city in the clouds and a vibrantly colourful festive vintage carnival. 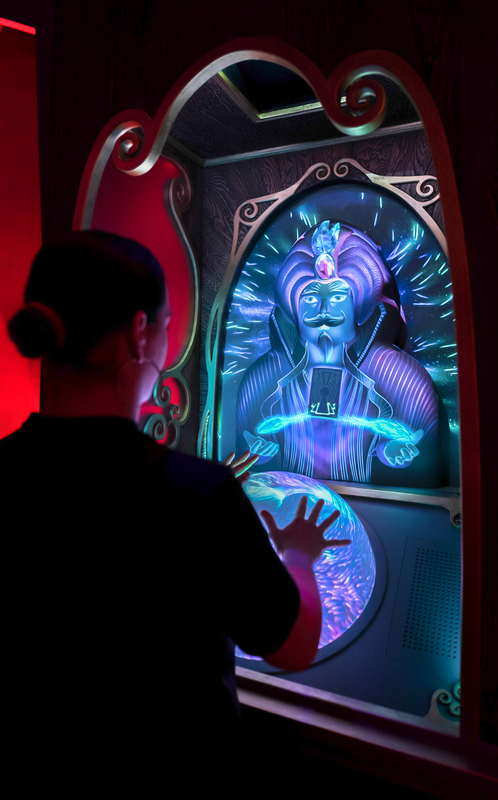 Guests are also invited to shapeshift using an interactive funhouse mirror, take and share amped-up in-character portraits in a multimedia photo booth and even have their future revealed by an enigmatic fortune-teller. Each gamified intervention offers visitors a chance to share in a unique and memorable moment together. 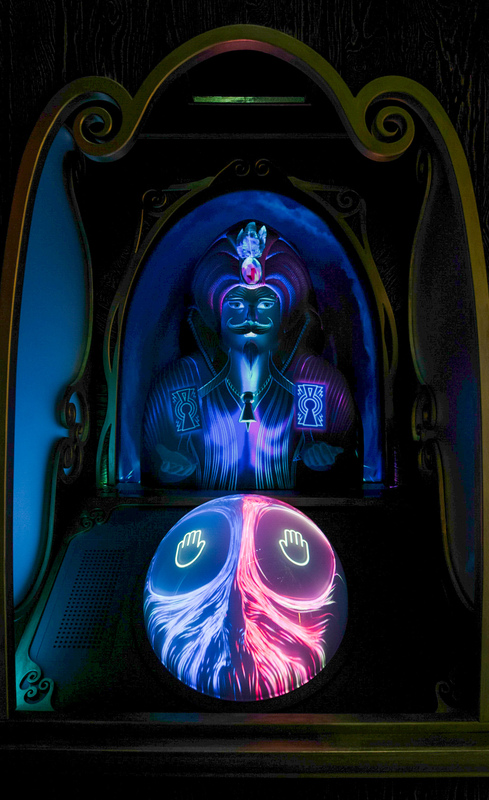 Integrating an advanced video projection mapping system, thousands of dynamically controlled light bulbs and fixtures, a state-of-the-art sound system and interactive installation, each carefully curated element is connected to offer guests a coherent and completely immersive experience. 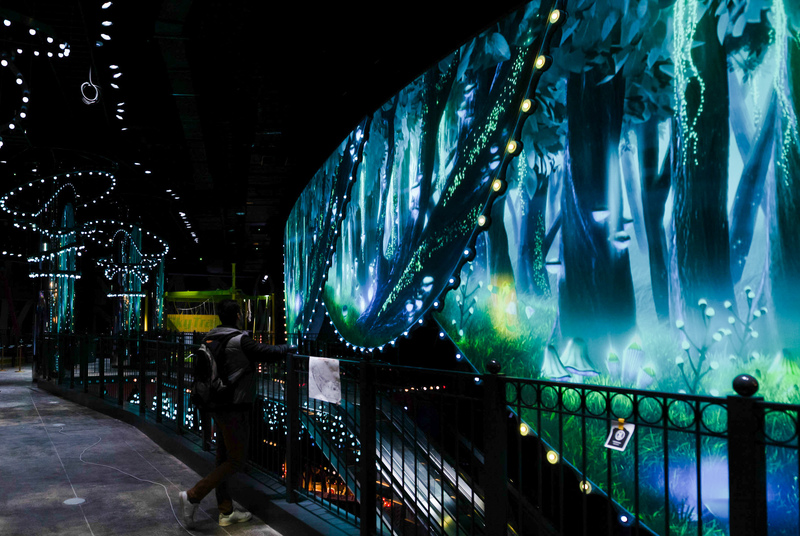 The seamless integration of multimedia tools conjures a playful landscape filled with ambient wonder. What Paradise City offers its guests is utterly unique, and we were thrilled to be part of this complex that pushes the boundaries of what a luxury entertainment experience can be. 때때로 꿈은 이루어집니다. 마치 Moment Factory(모멘트 팩토리)에서 느껴지는 것처럼 말이죠. 저희는 큰 꿈을 이루기 위해 도전하는 새로운 5성급 통합 리조트로 한국의 Paradise City(파라다이스 시티)에서 Wonderbox(원더박스) 테마파크 오픈을 준비하였습니다. 대규모 예술 호텔 단지는 한국의 관광 전문 기업 Paradise Group(파라다이스 그룹)과 일본의 엔터테인먼트 회사 Sega Sammy(세가 새미)의 공동투자 파트너십과 다수의 국제적 예술가와 건축가, 디자이너들의 긴밀한 협업 가운데서 탄생했습니다. 리조트는 Anish Kapoor, Jeff Koons, Damien Hirst, Yayoi Kusama의 작품들과 호화로운 스파와 레스토랑, 영감을 주는 객실 디자인을 갖추었습니다. 여러분께 새롭고 독특한 즐길거리를 제공하기 위해 Paradise City(파라다이스 시티)는 또한 시네마 퀄리티의 콘텐츠와 인터랙티브 게임, 분위기 있는 멀티미디어로 가득한 가족형 실내 테마파크인 Wonderbox(원더박스)를 준비했습니다. Wonderbox(원더박스)는 멀티미디어 기술을 사용하여 클래식한 어트랙션과 각종 엔터테인먼트 시설에 매혹을 더했습니다. 저희 총 컨텐츠 제작 팀은 여러분들이 전통적 카니발에서 펼쳐지는 상상의 나래에 푹 빠지실 수 있도록 몰입감 넘치는 세계를 창조해냈습니다. Wonderbox(원더박스)의 독창적인 건축물 안으로 들어서면 여러분의 움직임에 따라 반응하는 인터랙티브 장치가 여러분을 환영해드릴 것입니다. 천장에는 3D 프로젝션으로 매핑된 Wonderbox(원더박스)의 로고가 주변 환경의 변화에 따라 형형색색으로 변화합니다. 하루에도 수 차례 선보이는 Wonderbox(원더박스)의 조명, 비디오 콘텐츠, 시그니처 음악 공연은 여러분을 경이롭고 매혹적인 신세계로 모실 것입니다. 여러분은 상상의 존재들로 가득 찬 마법의 숲에서부터 달콤한 간식과 초콜릿으로 만들어낸 솜사탕 세계까지 지나오면서 다양한 세계를 만날 수 있습니다. 그 가운데서 구름 속에 감춰진 신비한 음악 도시와 생동감 넘치고 다채로운 페스티벌 빈티지 카니발을 즐기실 수 있습니다. 또한 인터랙티브 펀하우스 미러에 재미있게 비춰진 자신의 모습을 즐기고 멀티미디어 포토 부스에서 사진을 찍어 공유할 수 있으며 불가사의한 점술가가 알려주는 자신의 미래를 엿볼 수도 있습니다. 각각의 게임화된 개입은 여러분께 독특하고 기억에 남을 순간을 함께 공유할 기회를 선사합니다. 앞선 기술의 비디오 프로젝션 매핑 시스템과 역동적으로 움직이는 수천개의 조명 시설, 최첨단 사운드 시스템과 인터랙티브 장치를 통합함으로써 섬세하게 큐레이트된 요소들이 연결되어 머무르는 내내 완전히 몰입할 수 있도록 해드립니다. 빈틈없이 통합된 멀티미디어 도구들은 안락하면서도 경이로 가득 찬 즐거운 풍경을 불러일으킵니다. Paradaise City(파라다이스 시티)는 여러분께 최상의 독특함을 전해드릴 것입니다. 저희는 이제껏 만나보지 못한 최고의 럭셔리 엔터테인먼트 경험을 전해주는 원더박스의 일원이 된 것을 기쁘게 생각합니다.